Niche line Miller et Bertaux has launched Indian Study (Santal +++), a new unisex woody fragrance. 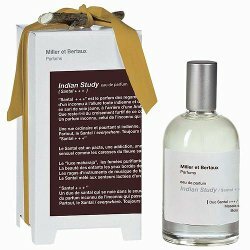 Indian study / Santal +++ is Miller et Bertaux thirteenth perfume, especially dedicated to sandalwood lovers. Sandalwood with three plus signs as a signature. Indian study / Santal +++ is a duo of the Mysore sandalwood, which has teh reputation of being the best quality of the Indian Sandalwood and bark of the Santal Amyris with purifying virtues. Indian study / Santal +++ is also the perfume of a masala mix with milky scents of curry and cumin. Indian study / Santal +++, all the refinement of wood varnish of Indian musical instruments to bewitching ragâ. Indian study / Sandal +++, an exaggeration of sandal which drowns in a sensuality all Indian and musky. Indian study / Santal +++, an uncompromising fragrance. Sandal at the peak. A perfume without genre. Women and men will recognize themselves in this fragrance. The notes feature caraway, turmeric, amyris, sandalwood and musk. Miller et Bertaux Indian Study (Santal +++) is available at Nose in France, in 100 ml Eau de Parfum.